Many thanks for your lovely comments on the Butterfly card - it's really nice to get feedback on my freebies and makes posting them worthwhile. Welcome too to my new followers. I know it's still July but you have to start sometime with the dreaded C cards. I have to admit that I'm struggling a bit for ideas so I thought I would do a Diorama and a Shelf Card as I think they are a bit different but still fold flat for posting. They are both sprinkled with glitter as was my little cat who was giving me a helping paw !! I really enjoyed making this card as it was so easy to put together so I thought I would share it with you. 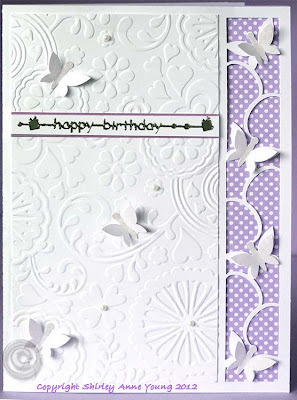 I decided to do it as white on white and used one of my cuttlebug folders to give some texture. 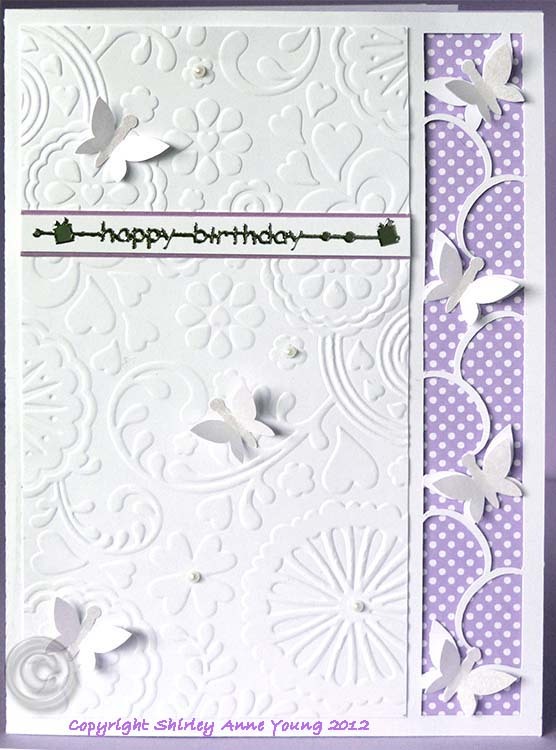 I had to join the flower folder as it wasn't long enough for my card so have hidden the join with a layered strip of card. 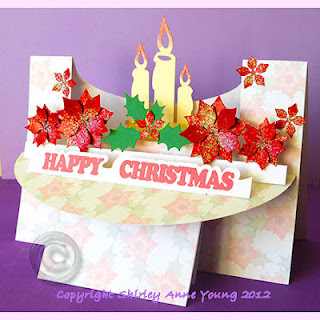 If you download the file please leave a comment and if you make and post a project with the template please link back to my blog. Personal use only please. Just thought I'd let you know about the Cameo Spotlight which is a new challenge blog for Cameo/Silhouette users. The first challenge starts on 11August so I hope you'll check it out, it really sounds like fun. Think I still have time to get this in to Less is More Challenge, 3 of anything on one layer. 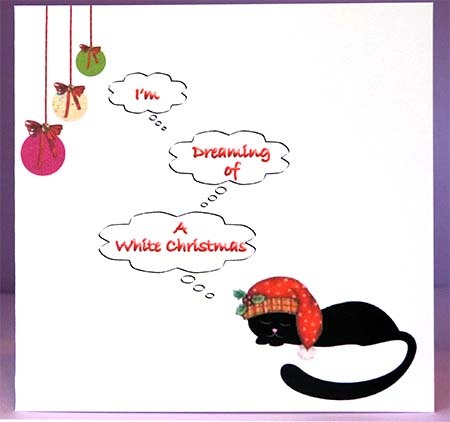 The little cat is purchased vector image to which I have added the Christmas hat. 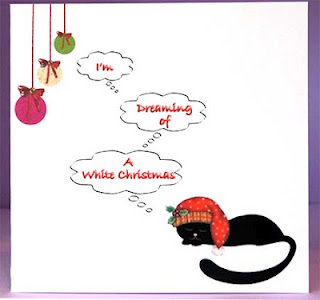 I used Craft Artist for the speech bubbles and baubles. Been a bit busy lately and not had much time for posting so first of all I would like to say welcome to my new followers - nice to see my numbers creeping up a bit. I did promise a few days ago that I would post the cutting files I used for the Flourish Heart card so here they are. This is the link to to the png download of the file which I posted earlier. 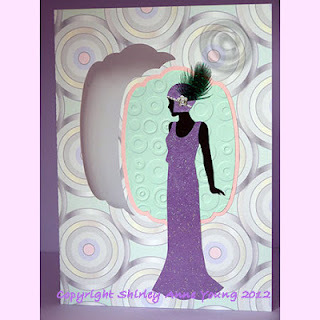 I love all things Art Deco and here is another addition to my range of cards in that theme. I used my Cuttlebug to emboss the top mat, must have had the folder for ages but don't think I've used it before but I thought it went quite well with the backing paper. To attach the feather I used peel offs, something else I've got loads of but seldom use these days. One day I must have a clear out !! I donate a lot of the cards I make to our local Cats Protection Group to help with their fund-raising and I made this one with them in mind. I hasten to add that my cat, Douglas, was not my inspiration as he much prefers to sleep in his favourite chair !! 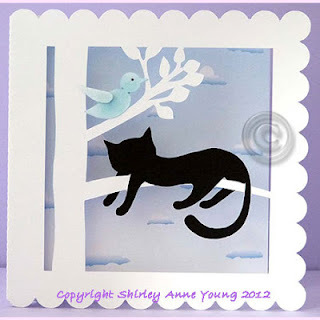 The template is available on my website and the backing paper is included. 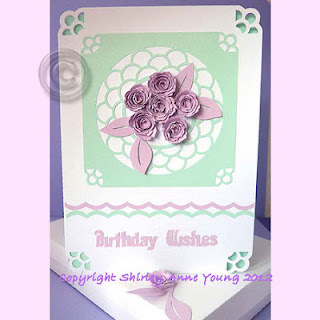 This is one of the cards I have made over the weekend featuring little rolled roses. I decorated the edges of the roses with glitter. I should have added it before I rolled them up but I forgot so just had to dab it on afterwards but I don't think it looks too bad. 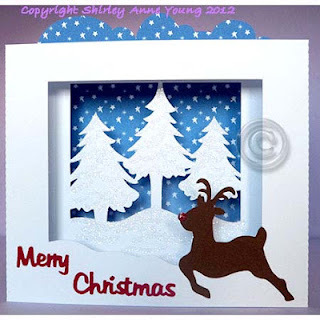 You can find the template here and a box to fit the card is also included. 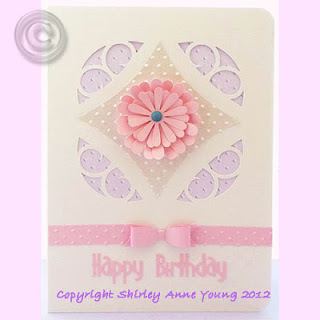 Here is the cutting file for the heart I designed for my Flourish Heart Card. I have also done it as a png file Please leave a comment if you download it - it only takes a minute and it means a lot ! !